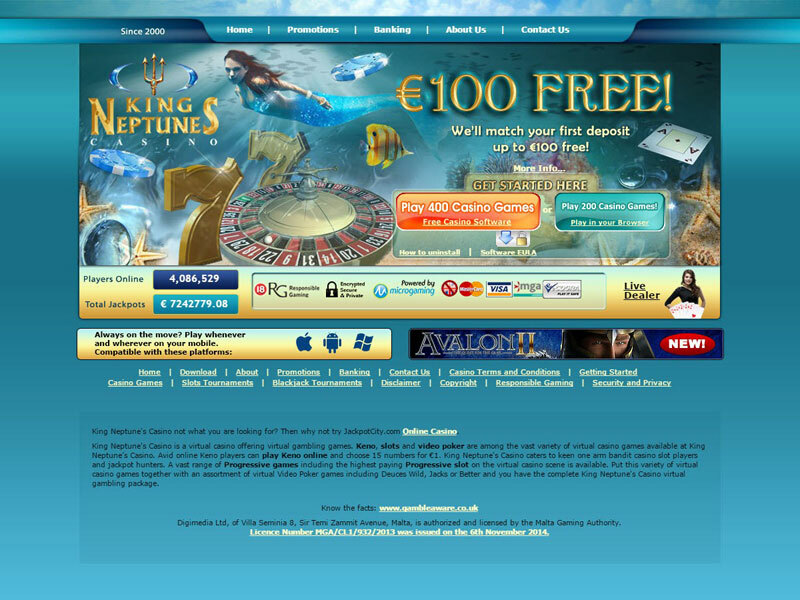 CasinoBonusNews → Casinos → "King Neptunes Casino review"
KING NEPTUNE’S CASINO is part of a super group of online gaming brands, Belle Rock Entertainment- a wholly owned subsidiary of Carmen Media Group Ltd. Tower Rock Ltd and is a company incorporated and registered in Gibraltar. And to reaffirm their commitment to fair game play, prompt payouts, player service and responsible casino conduct they have an eCOGRA (eCommerce and Online Gaming Regulation and Assurance) Seal of Approval, an independent organization based in the United Kingdom, which is devoted to improving and ensuring the integrity and security of online gambling. KING NEPTUNE’S CASINO is using Microgaming software platform. The software has very good feature like they employ electronic card-shuffling and randomization techniques to ensure fair game play. There is also Playcheck feature in which you can check and review all your game play activity and you can view your Account History by making use of our Transaction History facility. In the interests of transparency and fair casino operation, KING NEPTUNE’S CASINO publish monthly reports that state the percentage of payouts (being the percentage of winnings to wagered amounts as shown by the data log files) of our games. When it comes to online gaming, KING NEPTUNE’S CASINO has all standard Microgaming games. All their games are state of the art with outstanding graphics and fast and smooth game play. Their range of games consist of Blackjack, Roulette, Craps, Poker, Baccarat, Sicbo, Keno, Scratch Card, Video Poker, Progressive Jackpots, Slot machines and more! New games are constantly added each month, so there is definitely something for everyone. 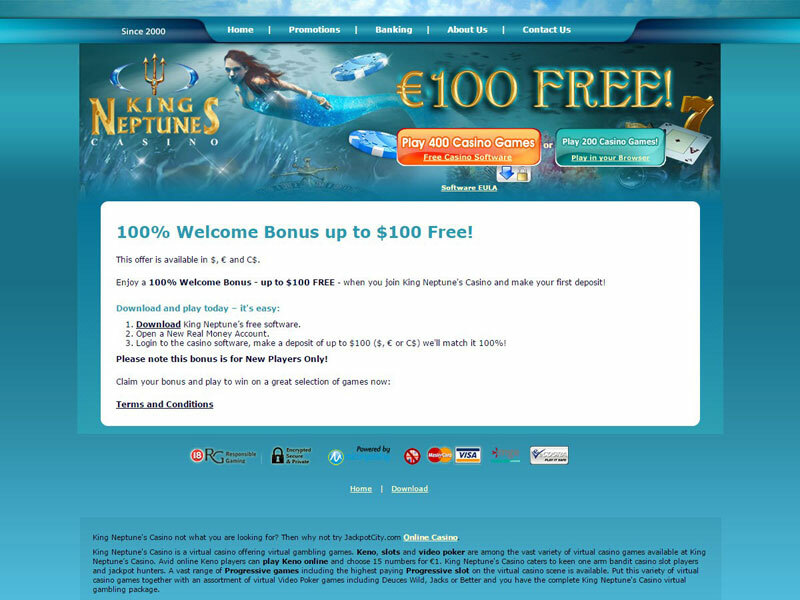 New players at KING NEPTUNE’S CASINO are offered 100% matching bonus up to $100 as a welcome to the casino when you first sign up. And once you become a Real Player, they will give you a Trident Cash Card. For every 10 deposit you make with their casino, there is a bonus that is waiting for you. So, you could just imagine how much you can earn toward your cash card if you deposit $50 or more. They also have loyalty club named Trident Club. For every $10 wagered, you will receive one Trident point. You can also look back at their exciting weekly and monthly promotions. You can also be to their tournaments, leader board competitions and many more. As their regular player, you also have an opportunity for special bonuses and gifts during your birthday, anniversary of play and as tokens of their appreciation for your loyalty. KING NEPTUNE’S CASINO had selected user-friendly banking facilities to ensure that depositing money into your Real Account and withdrawing your winnings is both easy and simple. They make use of 128-bit SSL encryption technology to ensure that all your banking transactions are kept safe and all your private details are in private. Their banking options include Neteller, UKash, Click2Pay, UseMyBank, Firepay, ECO Card, Payspark, Credit Card, and eCheck and deposits can be made in US Dollars, Euros or British Pounds. KING NEPTUNE’S CASINO support teams are friendly and efficient. They offer a 24/7 customer support via toll free telephone, e-mail and Live Help.